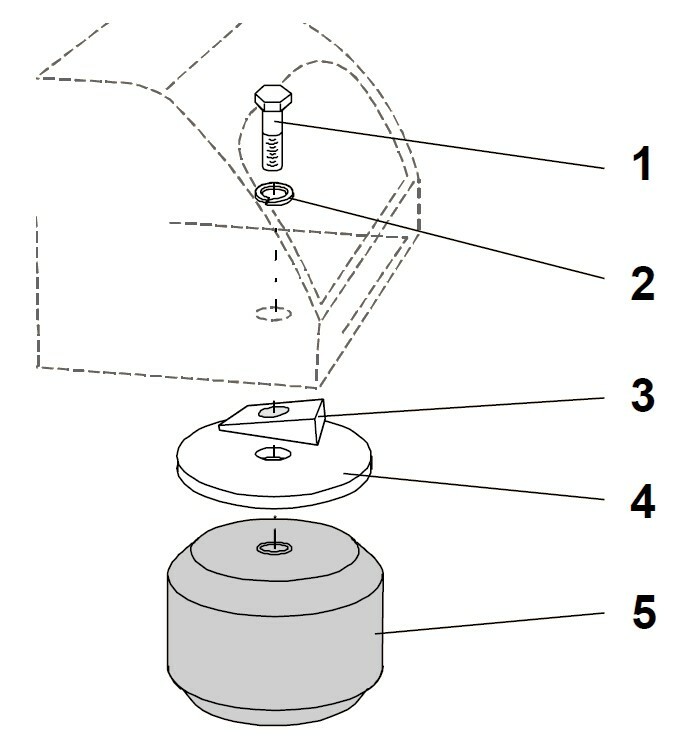 The best technical support and full vehicle suspension installation instructions. Lowest price Sierra vehicle suspension guarantee and expert service. GMC Sierra, 2005 vehicle suspension by Timbren are available from etrailer.com. For expert service call 800-298-8924 to order your Timbren Front Suspension Enhancement System part number TGMFK25S, or order online at etrailer.com. 14,000-lb Capacity. 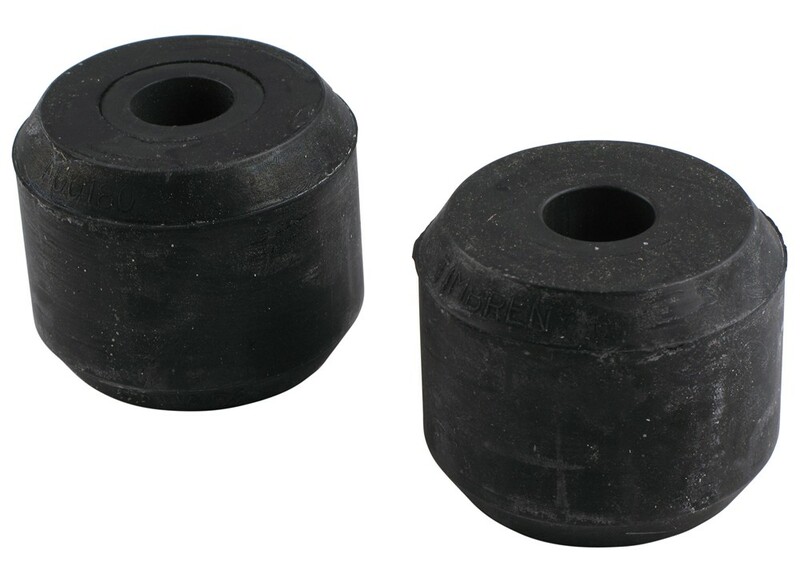 Great for trucks with plows, these front hollow rubber springs help to stabilize and level your GMC Sierra. They also provide a more comfortable ride by absorbing road shock and improving roll stability. Easy to install and use. 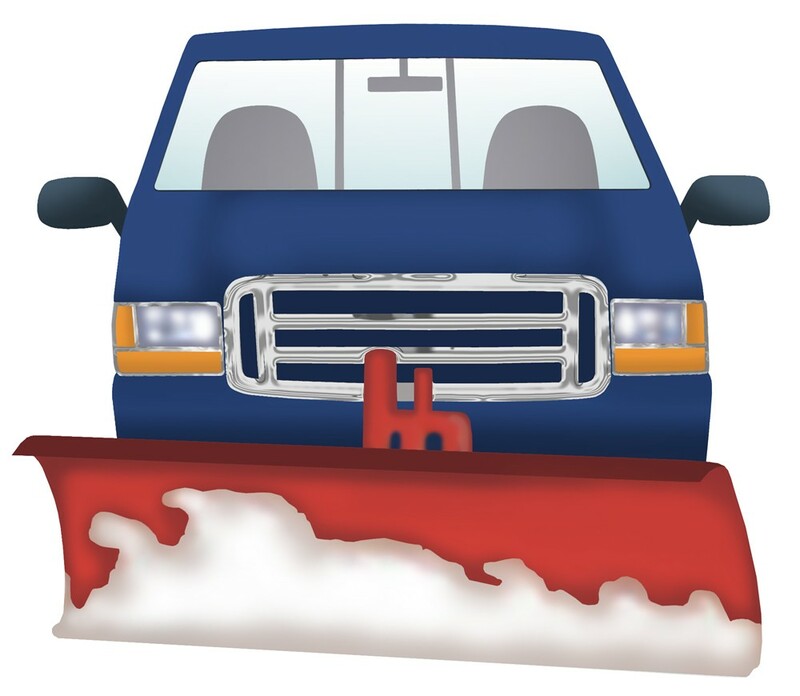 Just like the rear of your GMC Sierra will sag under the weight of a fully loaded bed, the front of your vehicle will sag when under the burden of heavy equipment such as a snowplow. In this case, the front axle is handling not only the weight of the equipment, but also more of the vehicle's weight. Overall GMC Sierra handling - traction, steering, and braking - is negatively affected. But the resistance from Timbren's Suspension Enhancement System works with your factory suspension to keep your vehicle level and improve your driving experience. 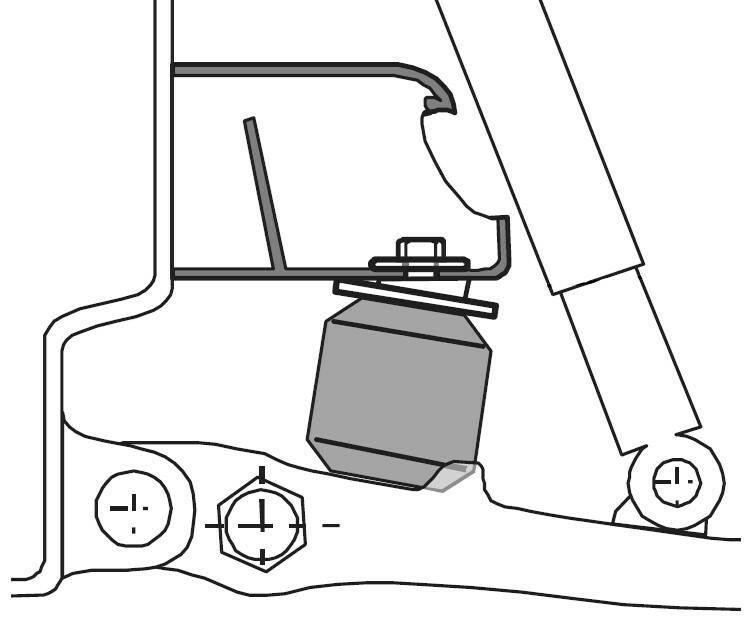 Timbren Suspension Enhancement Systems are designed to work progressively. 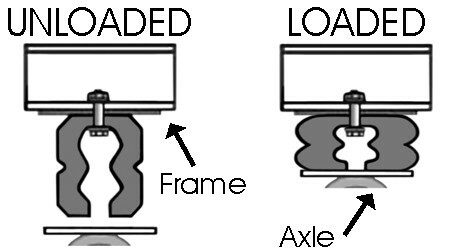 When the hollow rubber springs are compressed, the convoluted design causes them to quickly collapse along the folds. Once the folds are compacted, the stacked barrel shape increases resistance, stiffening the suspension and keeping your GMC Sierra level. Each hollow rubber spring works independently to support the driver's-side or passenger's-side of your GMC Sierra. This is helpful when you swerve or make sharp turns. Each spring is activated when it is needed, so body roll is greatly reduced. The independent action also works well when you're carrying off-center loads. Timbren's Suspension Enhancement System will help raise the front end of your GMC Sierra when you're using heavy equipment like a snowplow. This ensures that your headlight beams will be pointed in the right direction and tire wear will be reduced. If the plow is off-center or has an extension, the springs will automatically compensate for this as well. Today we're going to review part number TGMFK25S. This is the Timbren Front Suspension Enhancement System. 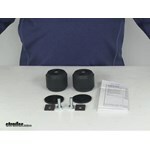 This is a custom fit part number, this is designed to fit the Chevrolet and GMC vehicles starting in 1996. What I would recommend since there's many vehicles it will fit on, I would recommend to go to our website and on the Use Our Fit guide and put your year and model vehicle and that will show you if this part will work for your application. 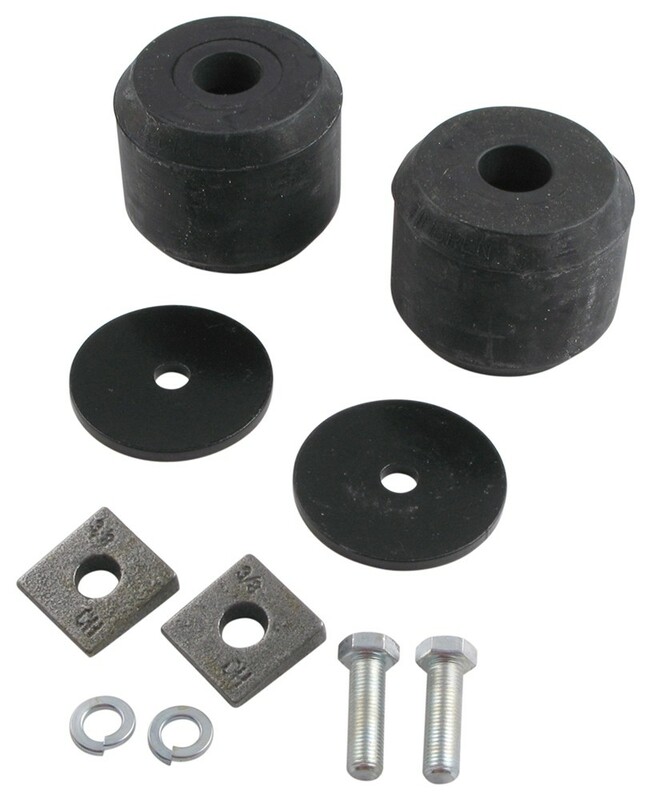 This kit will improve your suspension and handling, prevents body roll with improved weight distribution. It does stabilize the vehicle for better handling of heavy loads. It does adjust progressively to road and the load so you always have a smooth comfortable ride and it does provide additional support as needed. It does allow the spring ample movement while at the same time providing cushioning for light loads. It does increase the stability and gives you great performance while cornering, swerving or hauling large loads. This does take the brunt of the bumps in the rough loads and it does extend the life of your vehicle's suspension. You do have to make sure, though, it is designed to work with a suspension system that is in good working order and this system does not require any air hoses, compressors or manual adjustments. This part includes everything shown here on the table. It includes these two Aeon hollow rubber springs. It includes these specific brackets and the hardware for simple installation. When you do install these, it comes with a nice set of instructions that are pretty detailed. 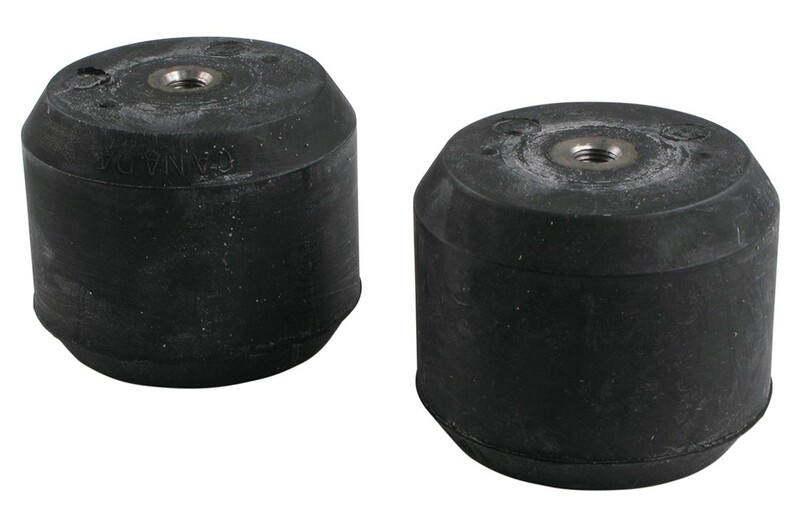 These will replace the axle bump stops on your frame, there's no drilling required. The capacity on these is 14,000 pounds but you do need to remember you do not exceed the vehicle's weight carrying capacity. Again, as I mentioned earlier, these are designed to work with a suspension system that is in good working order. This does come with a limited lifetime warranty. That should do it for the review of part number TGMFK25S. These are the Timbren Front Suspension Enhancement System. .
Order: RelevanceNewestRating - High to LowRating - Low to High 14,000-lb Capacity. Great for trucks with plows, these front hollow rubber springs help to stabilize and level your vehicle. They also provide a more comfortable ride by absorbing road shock and improving roll stability. Easy to install and use. I would buy again . these are worth 5 stars. These will be going on every truck I buy from now on. For your heavy snowplow, I recommend the Timbren Front Suspension Enhancement System # TGMFK25S over the Air Lift AirCell Custom Helper Springs Kit - Front Axle # AL52212. The Timbren Aeon Rubber springs are simply stronger and they work in the same way as the helper springs, yet offer more support on the front end, so that first inch gets support. 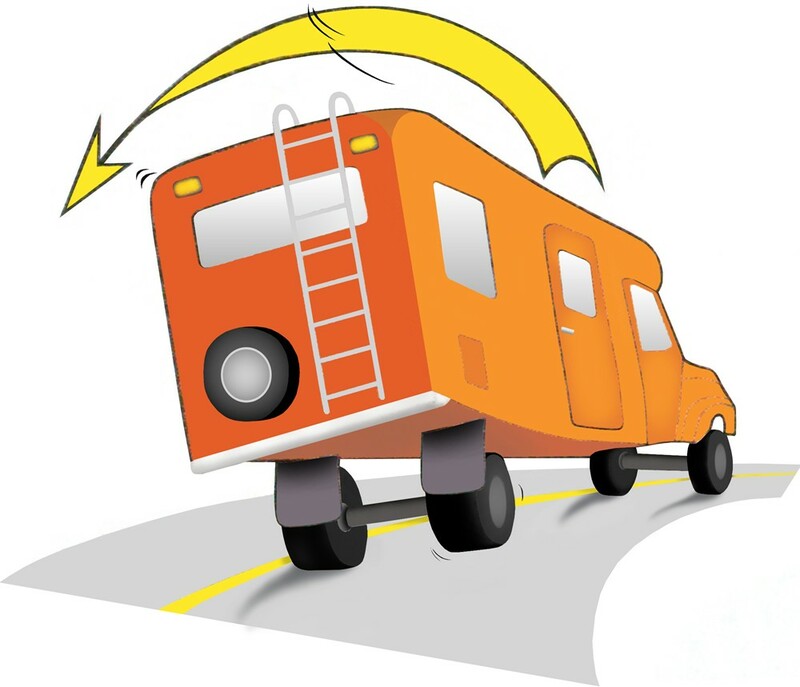 Yes, there is a 12 volt power source on the 7-way that is on your 2011 Ford F-53 RV. It will be on the 11:00 position of the connector as you look at the front of it. Check out the picture I attached that has a picture with all of the terminals of a 7-way labeled with their functions. You might want to test for voltage on this circuit with a Circuit Tester # 3808 as well just to be sure. 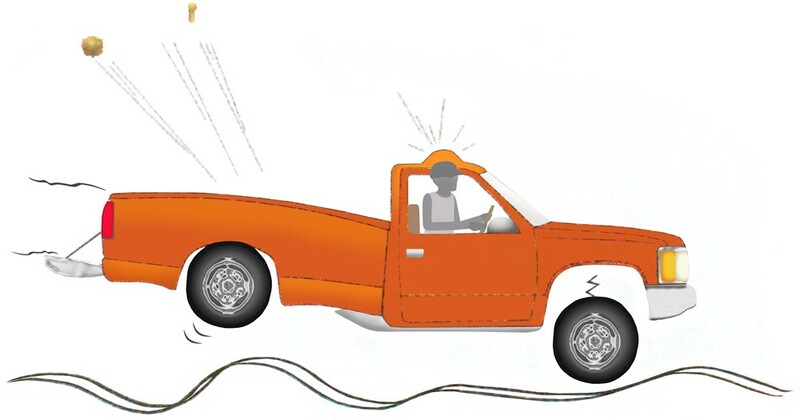 I also attached an FAQ article on trailer wiring that you might find informative. For the front suspension of your 2002 Suburban, I'd recommend the Timbren Aeon Springs, part # TGMFK25S. Installation is straightforward. You'd remove existing bump stops, and use the hardware and existing holes to instal the rubber Aeon spring. The springs get progressively stiffer as more weight is added to them, they typically come into play when a plow or some other very heavy piece of equipment is installed on the front of the vehicle. I'll link you to the installation instructions. The Timbren system I would recommend recommend would be the part # TGMRCK35S. It's the lighter duty of the two kits but the heavier duty part # TGMFK25S but it's going to provide a very stiff ride. The # TGMRTT35S still provides the 8,600 lbs of support which will work great. The HD is really needed only in very extreme situations like tow trucks. For your 2004 GMC Yukon XL we have the Timbren suspension kit part # TGMFK25S which fits the front suspension and then the part # TGMRSB4S which fits the rear. Both of these kits act like bump stops except are much larger to make contact sooner than the standard bump stop so that they can provide additional suspension support. I checked with Timbren and the bolts that come with the Timbren part # TGMFK25S that you referenced are M10x1.5X30. 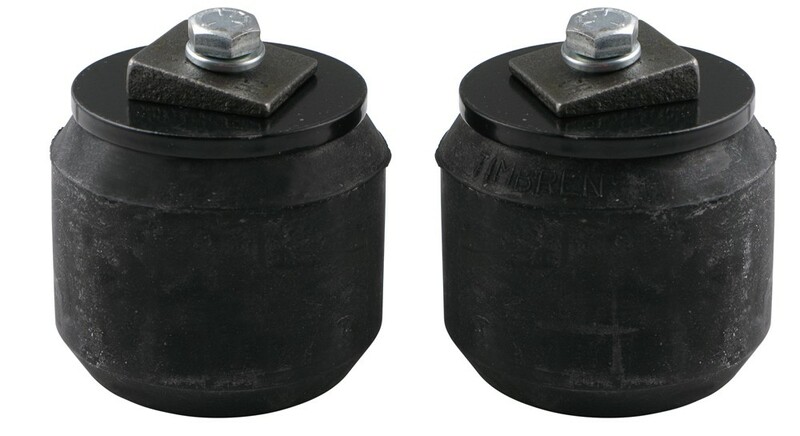 We have both front axle and rear axle Timbren rubber spring suspension enhancement kits for your 2000 Chevy Silverado 1500 that are displayed on the linked page. You can also see other kit options including air bags. For a rear axle Timbren kit you can use # TGMRCK15S which fits both 2WD and 4WD models. If you are interested in a front axle kit too, in case you use a snowplow for example, you can use Timbren kit # TGMFK25S for 2WD or kit # TGMFK15A for 4WD (if the truck is a 2-door model). What you would want to use is a Timbren Spacer for Raised vehicles # A25723-90AH00. This spacer is 1 inch thick so you would want to use two of them since you have a 2 inch lift. For the rear you would want the Timbren Rear Suspension System # TGMRCK25S, for the front you would want the Timbren Front Suspension System # TGMFK25S. Since you will need 2 spacers per Timbren and you plan on putting them on the front and rear axles is looks like you would need a total of 8 spacers. The part # TGMFK15A that you referenced will fit a 2001 Chevy Suburban 1500 4x4. If instead you have a 2500 model you would want the part # TGMFK25S. By nature these Timbren kits will not stiffen up the front suspension unless you have a decent load on the front of the truck. Unloaded you shouldn't notice them installed. I spoke with my contact at Timbren and the Rear Suspension Enhancement System for your 2004 Mitsubishi Montero is part # TGMFK25S. This system eliminates suspension sag, cushions road shock, reduces sway, and improves roll stability. The jounce spring kit recommended for the front axle of your 2004 Chevrolet Tahoe 2WD is part # TGMFK25S. The kit you referenced, part # TGMFK15A, fits the front axle of the 4WD version that does not have the police package. All front and rear suspension enhancement kits for your 2WD Tahoe, including jounce springs, air bag kits and coil helper springs, are shown on the linked page. We have the perfect product for you. The SuperSprings helper springs part # SSA13 will give your rear suspension 5,000 total lbs of support and will greatly reduce the amount of sway on your truck. A coworker of mine installed these on his vehicle and said that along with the suspension support he was surprised by how well these worked as an anti-sway device. Timbrens are going to be what I would recommend for your 2004 Chevy Tahoe. They are better suited for heavier duty applications like what you have so for that the # TGMRYS4 would be what you would want for your 2004 Chevy Tahoe. I attached an install video for you to check out as well. For the front you would want the Timbren kit part # TGMFK25S.